Maine Sports Media: RED SOX YANKEES OPENING NIGHT LIVE BLOG! RED SOX YANKEES OPENING NIGHT LIVE BLOG! WIN STUFF!!! 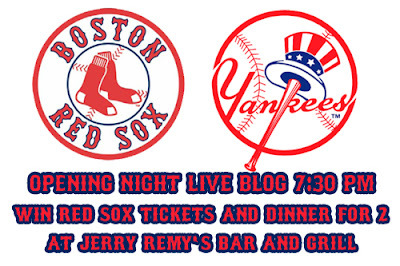 MLB 2K10 FROM 2K SPORTS, PORTLAND SEA DOGS TICKETS AND A GRAND PRIZE PACKAGE OF DINNER FOR 2 AT JERRY REMY'S NEW SPORTS BAR AND GRILL AND 2 RED SOX TICKETS! DON'T MISS OUT!!! LIVE BLOG IS BELOW!!! I am getting excited about the game tonight...Someone just told me that pedro is throwing out the first pitch..anyone know if the is true? Yes, that's the hot rumor going around. I assume Bruce Hurst and John Dopson weren't available. Well ...that feels a little better...one run....Hey anybody know who the surprise musical guest is??? I know Steve Tyler is singing but who is the other musical quest???? Not panicking...but this is not exactly the start I hoped the Sox would get off to! Especially against NYY. Click on the "play" button above, join the live blog, and wait for us to ask the trivia question. Like the Blog during the game, hope you do more! Like the Blog during the game, hope you do more in the future! Can we please stop trotting out Stephen Tyler for every big Red Sox event.. He can't sing the National Anthem, or God Bless America.. And this just in folks, Neil Diamond is going to take his aging voice to the field to shower us with a wonderful rendition of Sweet Caroline. Wow! What can I say, this was like the ALCS all over again. Going to be a great season!